You guys all know how much I love Pixar (and if you don’t look at my series of Pixar Reviews). So it is such a treat this year to have 2 Pixar movies!!!! And the cool thing is they are both so different. Inside Out we got a thoughtful, funny, moving story of the inside of a little girls mind. And in Good Dinosaur we are getting a Finding Nemo-like adventure of a dinosaur named Arlo trying to find his family. He meets a boy named Spot who becomes his travel-mate and he also meets a group of t-rex dinosaurs who he appears to be friends with. I don’t know a whole lot else about the story but they just released a new trailer yesterday and it looks like a beautiful film. I am so impressed with the realism of the plants, water, and other scenery. I am also excited about the relationship between Arlo and Spot. It looks like it is going to have a ton of heart to it. The only thing I am not sold on yet is the design of the T-rex dinosaurs. They look a little unfinished for Pixar so I hope they are still working on them and will be better in final film. What did you guys think of the new trailer? Here are some more of my thoughts. I actually like the new trailer. I watched it a couple nights ago and boy I will say that it makes me even more excited for the film. Chances are it probably won’t be as good as Inside Out, but I bet it will be really enjoyable nonetheless. What do you want to get that they’ll probably show a teaser trailer for Finding Dory and a new trailer for Zootopia on Good Dinosaur? Oh that would be cool. I hope so. 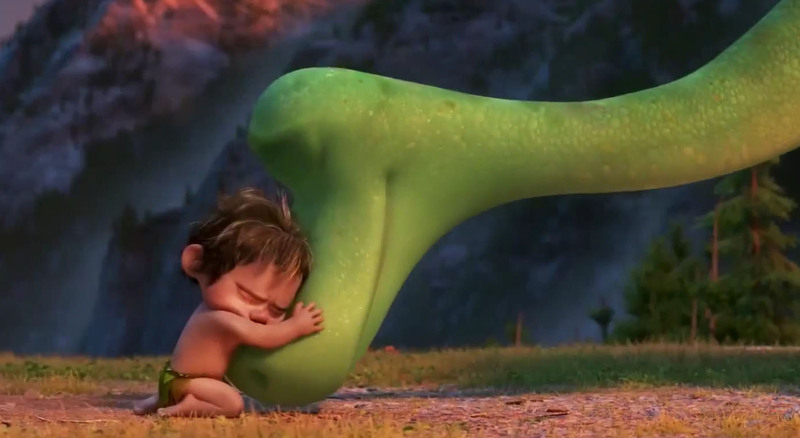 I am so looking forward to Good Dinosaur! Inside Out and it seem so different tough to compare but I am loving what I see with the exception of the trex design that I’m not crazy about. Rest I love! Awesome! I love the rest too. I’m still not 100% excited about this film. I’m still getting a ‘The Croods’/’Ice Age’ vibe to this film and not liking it, but I’ll havta see the film for myself to see what it’s like. But, I’m pretty sure I won’t like this more than ‘Inside Out’. That’s happened many times before, lol! I’m sure it will be good since it’s Pixar, but it looks like a film that I’ll probably not watch often.